England’s last-16 World Cup tie against Colombia is the national side’s “biggest knockout game for a decade”, says manager Gareth Southgate. England will play the South Americans on Tuesday after a 1-0 loss to Belgium saw them finish runners-up in Group G.
Southgate said: “What we have to do is prepare for a thrilling knockout game. Our objective was to qualify from the group and we have done that. England defeated Tunisia with a last-gasp Harry Kane goal and thrashed Panama 6-1 in their second game, as both themselves and Belgium guaranteed progress to the knockout stage with a match to spare. Southgate and Belgium boss Roberto Martinez made wholesale changes to their starting line-ups in Kaliningrad, with both aware that finishing second offers what appears a more favourable route through the knockout rounds. Reality check for England or glancing blow in phoney war? Should they beat Colombia, England will face Sweden or Switzerland, swerving a potential quarter-final against Brazil and also meaning they avoid the side of the draw which features four of the seven highest-ranked sides in the world. Adnan Januzaj settled the game for Belgium with a brilliantly-curled effort in the second half at the Kaliningrad Stadium. Southgate said: “This was a game we wanted to win but the knockout game is the biggest game for a decade so we needed to make sure our key players were reserved. The players gave everything. “We kept pressing until the end. I think the supporters understand what the most important thing is. None of us know if this side of the draw is advantageous or not. Martinez added: “The only thing we are concentrating on is playing Japan. You have seen that making predictions in a World Cup is difficult. Kane has been in prolific goalscoring form, netting 135 in all competitions for Tottenham over the last four seasons. The striker has been given the captaincy for the World Cup and started the tournament by scoring five goals in the first two games to top the Golden Boot chart, but he was left on the bench for the full 90 minutes against Belgium. “He was brilliant about it,” Southgate told BBC Radio 5 live. “His priority, like ours, is the team. Did Southgate risk losing momentum? Leaving Kane out of the side was one of eight changes made by Southgate from the Panama game and questions were asked about whether the loss had halted England’s winning momentum. Two years ago, former boss Roy Hodgson was heavily criticised for making six changes in their final group game at Euro 2016 against Slovakia. England drew 0-0 to finish second in the group behind Wales, and were then beaten in the last 16 by Iceland. Southgate said: “With respect, in the Euros, we were only ahead for a few minutes of any of the games and here we’ve played well in the games leading up to this. Tonight, we’ve played OK. I don’t think anyone played poorly. “We didn’t have the link between the lines quite as well but there were good individual moments and a lot we can learn from. We don’t like to lose matches, but the primary objectives from the game we’ve got. 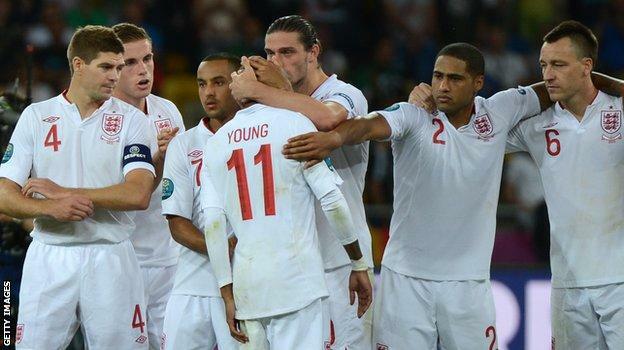 The knockout stages mean England could face the prospect of a penalty shootout if scores are level after extra time. England have a horrendous record from the spot – losing via penalties at the 1990, 1998 and 2006 World Cups, as well as the 1996, 2004 and 2012 European Championships. “We have been practising and going through strategies since March,” said Southgate. Former England captain Alan Shearer on Match of the Day: “It was a little bit flat, there definitely was not the spark and energy we have witnessed in the previous two games. “I do not accept they did not know whether to win the game or not. It was not a game they had to win but they are representing the country. They wanted to keep the momentum going, winning is a great habit to have. Former England midfielder Jermaine Jenas: “Gareth Southgate said some of players needed 90 minutes and it looked that way for a few of the players. Eight changes to the side was maybe a step too far for what we have at our disposable.